Lady Buffs win big, play No. 3-ranked North Marion Huskies Thursday in Buffalo Dome. Two blowout wins proved the Lady Buffs are a team determined to make the postseason this year. 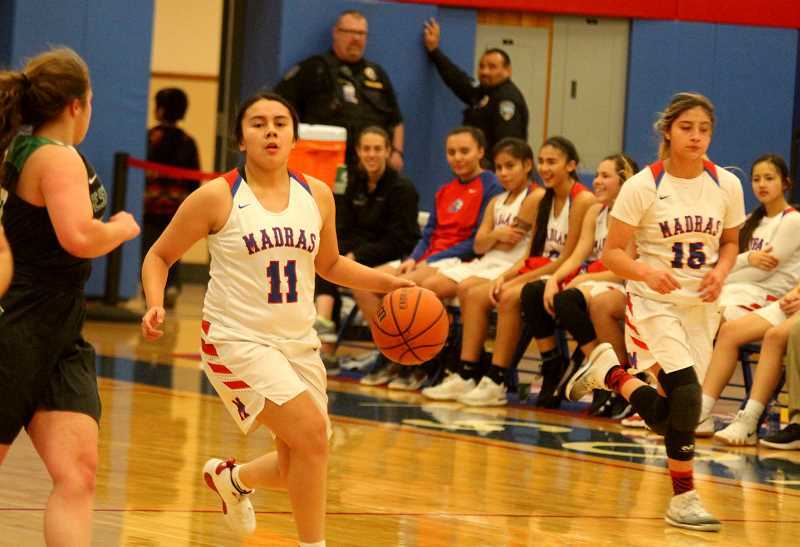 Madras beat Corbett (3-16) 79-25 Friday after beating Estacada (3-17) 54-24 Tuesday. Madras has a big Tri-Valley League showdown against the No. 3-ranked North Marion Huskies (6-0 TVC) on Thursday at 7 p.m.
Corbett was no match against the White Buffalos and Madras went on a 9-0 run to start the game and never looked back. The Lady Buffs took a incredible 44-6 lead at the end of the first half, outscoring Corbett 24-2 in the first quarter and 20-4 in the second quarter. Madras scored the most points in a game all season and moved to 13-6 overall, 5-1 in the Tri-Valley. The Lady Buffs had very balanced scoring with Jayden Davis leading the way with 12 points. Niya Bagley ended the night with 10 points, while Chloe Smith, Kalise Holliday, and Jackie Zamora-Heath all finished with 8 points. Speed, athleticism, and skill. The Lady Buffs showed all three on Jan. 29, putting on a basketball clinic on the Buffs' gym with a 54-24 victory over Estacada. Davis, who has been on a scoring tear, scored the first seven of the Lady Buffs eight points, helping Madras take a 8-1 lead. The Rangers cut the Buffs lead to 10-5 near the three-minute mark in the first quarter before head coach Jerin Say called a timeout to regroup. After the timeout, Davis found Zamora-Heath in transition for a fast break lay-in. 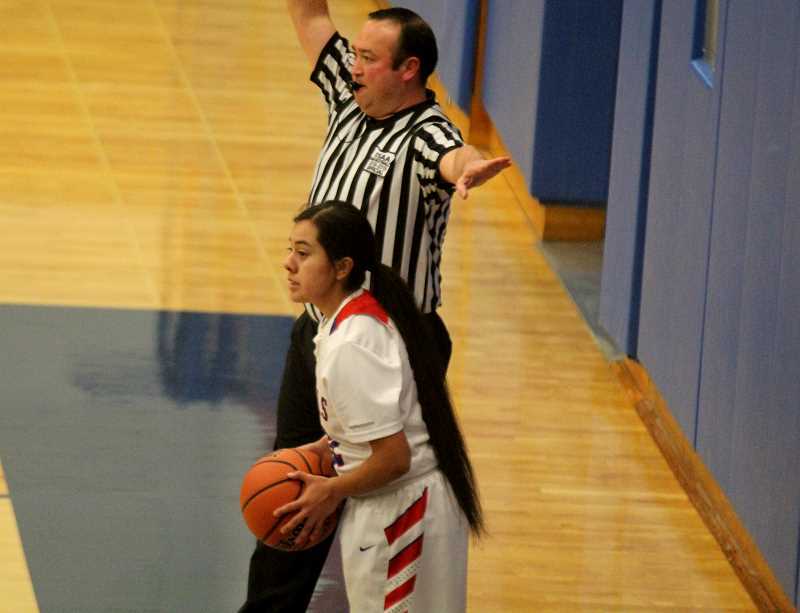 Ericka Olivera stole the ball from the Rangers for an easy score, and with two seconds left in the quarter, Zamora-Heath found Davis on an inbounds play, and Davis hit a deep three as the time expired. Madras had a 18-5 lead at the end of the first quarter, with Davis scoring 13 of those points. Estacada scored the first four points of the second, but Bagley was able to find an open Davis from behind the arc, and a few plays later Zamora-Heath dribbled along the baseline and found nothing but net on a graceful floater. Zamora-Heath passed the ball to Smith-Francis at the top of the key and she buried an open shot. Zamora-Heath was able to make another basket in transition and Smith nailed a 3-pointer. Estacada called a timeout with 3-minutes left in the half and the Lady Buffs had a 20-point lead. The White Buffalos were able to find most of their success on their full court press, creating turnovers, chaos and transition buckets. Jiana Smith-Francis dribbled the ball coast-to-coast, making a contested floater and after Zamora-Heath made a pair of free throws, she scored on a tough drive to the hoop. Say called back the Lady Buffs' full-court press at the end of the half and Madras went into the locker room with a 37-13 lead. Davis scored 16 points in the first half and Zamora-Heath was behind her with 10 points off the bench. "Knowing I am the first one that comes off the bench, I have to know I am substituting right away and need to provide and help the offense and the starters," said Zamora-Heath. Madras had a 29-point lead in the second half and put in their second unit with 3:20 left in the third quarter. The Lady Buffs took a 47-18 lead at the end of the third and held the Rangers to six points in the fourth quarter for the victory. 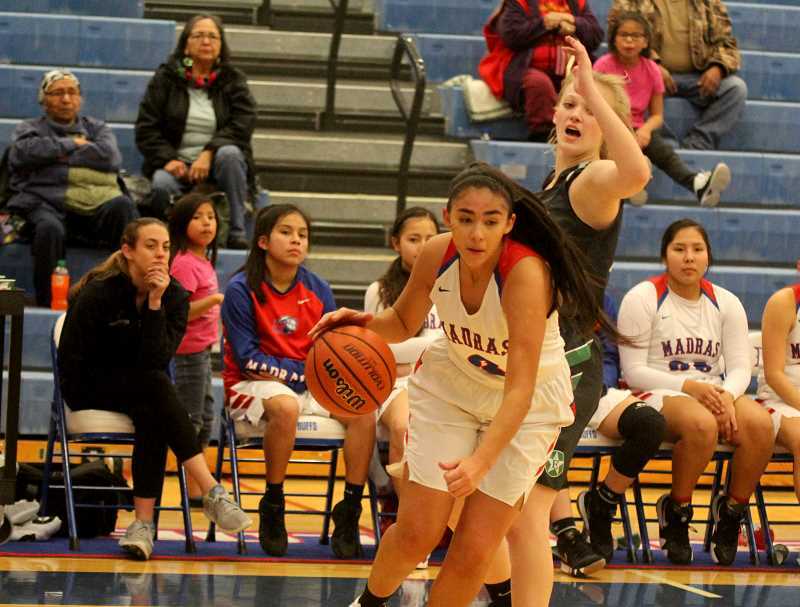 Madras held Estacada to single-digit scoring in every quarter and forced the Rangers to turn the ball over 46 times. Davis was the leading scorer for the Buffs, hitting three of Madras' six 3-pointers, scoring 18 points on 7-for-11 shooting, while also adding five rebounds. Zamora-Heath came off the bench and had 10 points, four assists and two rebounds. Smith ended the game with 7 points, while Smith-Francis and Vanessa Culps both added 5 points. "We were really just trying to improve our press, for our North Marion game (on Thursday night)" Zamora-Heath said. "They have different presses and also get out and run, so we were trying to have a man press, while switching things up, giving them different looks to catch them off guard." "Our recent success has come down to teamwork," she said. "We are doing a lot of team bonding, getting to know each other, make sure everyone knows the plays, while giving it our all in practice. The team needs to start coming out strong, running and have a good strategy for the second half of league."